“People's Grocery, has been farming on the same 1/4 acre urban plot of land for 5 years now, and working on such a small site, we needed to make sure we were using every corner of our space appropriately and efficiently. Nick came into our lives and provided so much wisdom, expertise, and concrete assistance in making our vision a reality. He listened carefully to our ideas and respected our knowledge of the space. He brought the knowledge and practice he has in permaculture design as a tool to help us make the most of our space. He supported us through clarifying our goals and limitations, and encouraged us to draw our own design, which we then edited with him. The final report included so much more than just a design. It also included 11 pages of in depth information about how to implement the design and background information on each element. Every time we worked with Nick, I learned so much about the garden and the natural cycles that go on in it! I came away not only with a design, but with a deeper understanding of the land we work on." The project was implemented on Saturday February 1st, 2014, when People's Grocery launched the celebration of African-American History month with a heartfelt, homegrown event commemorating the myriad contributions of Oakland's Black and Brown Farmers. The tribute commenced promptly at 10:00 AM, with soil libation and an appreciation of Mother Earth. Gratitude was offered for honorees and other attending contributors to food justice, who lend daily time, heart, energy, imagination, innovation and love to planting and tending seeds for a bright, beautiful future here in Oakland. "We wanted to gather the community and plant more trees, we also needed to pay respect to all the Black and Brown Farmers who have contributed to this soil and to this garden and to food justice in Oakland," remarked Lissa Vanderbeck, Garden Co-Coordinator. She and Larry Davis, Manager at Cal Hotel Garden, successfully co-hosted about 125 members of the community in a beautiful setting where everyone including little ones, teens, grown folks, elders, farmers, politicians, artists, teachers, scientists, community folks, activists and more mingled and participated happily in the programming of the day. Amidst ample sunshine and bees buzzing, folks enjoyed the urban oasis at The Cal Hotel Garden, which exists as an incubator for wellness, community building and learning space for the key programs of People's Grocery. 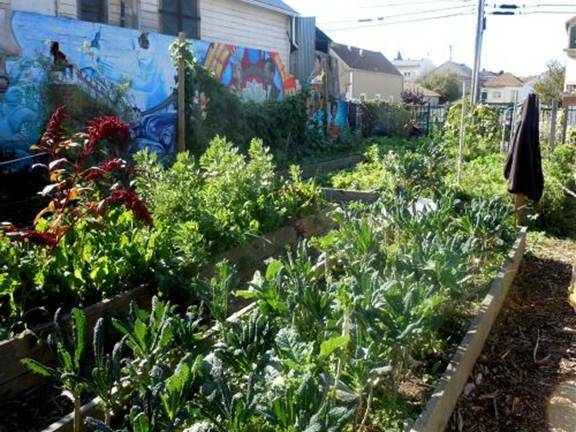 "The garden is here to support leadership development; diversity in West Oakland for resident food choices and to continue our work of promoting often difficult but necessary conversations across class, race and culture, and just give people in the community a place of their own that's a real resource." remarked Jumoke Hodge, Program Director at People's Grocery. The joyous, eclectic celebration included the planting of 12 trees, a reading of each honoree's plaque (which will live beside the trees dedicated to each of them planted on that day), good music, poetry, lots of great food, laughter, workshops and networking amongst people concerned with enjoying and promoting fresh air, earth, sunshine, healthy soil and food justice in West Oakland and the world community at large.